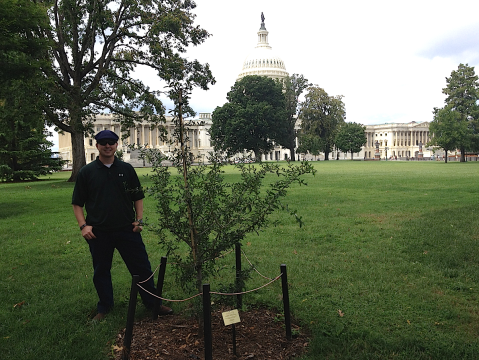 Its parents may be shrinking, but the offspring of the Toomer’s Oaks planted in May 2011 on the Capitol’s southeast lawn has grown exponentially since its sapling days. In May, we were told the tree’s tallest shoot measured nearly nine feet, or nearly two Harvey Updykes, but the photo accompanying the report didn’t do justice to just how high that actually is in real life, nature-finds-a-way terms. The photo snapped this weekend by friend of TWER Walt Austin, he of the celebratory cigar, does. That sucker is darn near rollable—and not just for photo ops (which can now include a corrected plaque). Click to enlarge. I’ve made the site twice, now. I feel special. For reference, I’m 5’7″ tall. So the tree is growing well! It’s growing fast! War Eagle! I was there in April…it’s looks much bigger now. Yea!